This sauce is anything but humdrum. It packs a punch in an unexpected and exciting way. 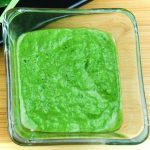 Delicious as a dressing, dip, or spread, it has become a favorite staple in my kitchen. This is a simplified chimichurri that can be made in a matter of minutes. For a well-balanced, nutrient dense meal come back tomorrow for Steak Salad and Chimichurri.